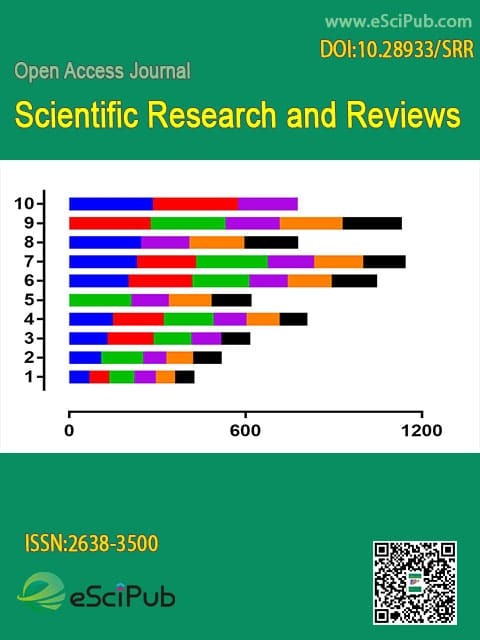 Scientific Research and Reviews (ISSN:2638-3500; DOI:10.28933/SRR) is a peer reviewed open access journal publishing articles in Scientific Research and Reviews. Assistência De Enfermagem Ao Paciente No Período Perioperatório De Cirurgia Geral: Uma Revisão Integrativa. Fatores De Risco Associados À Osteomielite Pós Trauma. Manuscript Title: The title should be a brief phrase. Author Information: List full names and affiliation of all authors, including Emails and phone numbers of corresponding author. Abstract: The abstract should be less than 500 words. Following abstract, a list of keywords and abbreviations should be added. The keywords should be no more than 10. Abbreviation are only used for non standard and long terms. Introduction: The introduction should included a clear statement of current problems. Materials and Methods: This section should be clearly described. Results and discussion: Authors may put results and discussion into a single section or show them separately. 1. Avinaba Mukherjee, Sourav Sikdar, Anisur Rahman Khuda-Bukhsh. Evaluation of ameliorative potential of isolated flavonol fractions from Thuja occidentalis in lung cancer cells and in Benzo(a) pyrene induced lung toxicity in mice. International Journal of Traditional and Complementary Medicine, 2016; 1(1): 0001-0013. 2. Vikas Gupta, Parveen Bansal, Junaid Niazi, Kamlesh Kohli, Pankaj Ghaiye. Anti-anxiety Activity of Citrus paradisi var. duncan Extracts in Swiss Albino Mice-A Preclinical Study. Journal of Herbal Medicine Research, 2016; 1(1): 0001-0006. Tables and figures: Tables should be used at a minimum with a short descriptive title. The preferred file formats for Figures/Graphics are GIF, TIFF, JPEG or PowerPoint. Publication fee: The authors will be contacted about the publication fee after a manuscript have been accepted. Proofreading and Publication: A proof will be sent to the corresponding author before publication. Authors should carefully read the proof to avoid any errors and return the proof to the editorial office. Editorial office will publish the article shortly and send a notice to authors with the links of the paper. Scientific Research and Reviews is a peer reviewed open access journal publishing research manuscripts, review articles, editorials, letters to the editor in Scientific Research and Reviews (Indexing details). To ensure the quality of the publications, all submitted manuscripts will be peer-reviewed by invited experts in the field. The decisions of editors will be made based on the comments of the reviewers. Please feel free to contact our rapid response team if you have any questions. Our customer representative will answer your questions shortly. Please submit your manuscript by the form below or send it to submit_manuscript@escipub.com (use "Scientific Research and Reviews" as the email subject line). Note: Please compress all documents (manuscript, cover letter et al.,. ) into one .Zip file and then upload the Zip file. eSciPub LLC © 2015-2019 All Rights Reserved.